So this weekend has been the first one of several "double XP weekends" leading up to the launch of the expansion. From what I've seen, people have been going absolutely bonkers about it. I couldn't read Twitter or participate in any conversation in guild without multiple people piping up about OMG how many levels they already gained today, how much XP they just got for a single quest or how far ahead of the levelling curve they already were. Personally, I've once again been living up to the tradition of being a grinch in regards to whatever the newest thing is that everybody else seems to love. Don't get me wrong, I don't begrudge anyone their fun. You like levelling super-fast? Good for you. I have to admit that personally, I just couldn't fight the feeling that this whole thing is just all wrong. I understand why Bioware is doing it, to push players towards the point where the expansion content will be relevant to them, and I've heard all the arguments from people about why levelling at the speed of light is great. Yes, I enjoy playing different classes at max level as well, and I do have eight fifties myself, so I've gone through the non-class story arcs multiple times already. Still, the point remains that SWTOR's levelling content is the best part of the game. If you find levelling so boring and tedious, why are you playing this game instead of a MMO that is more focused on max-level content? I only dipped my own toes into the accelerated levelling waters very briefly, by rolling a new consular to see what kind of effect the double XP had on the starter planet experience. I can't comment on how it affects the speed of levelling, since I tend to bimble around, get distracted, and idle while chatting regardless of how much XP I get for each task, but it was certainly unusual to be level thirteen by the time I left Tython. Other than that I didn't feel much motivation to do a lot of levelling this weekend though. 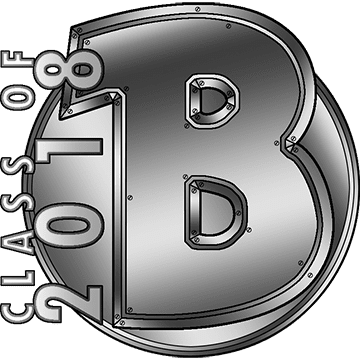 I just don't see the fun in skipping ahead quite that much; it's fast enough at normal rates of experience gain (for subscribers) and I pretty much always end up picking and choosing different bits of content to play through anyway. Fortunately I had other things to do. 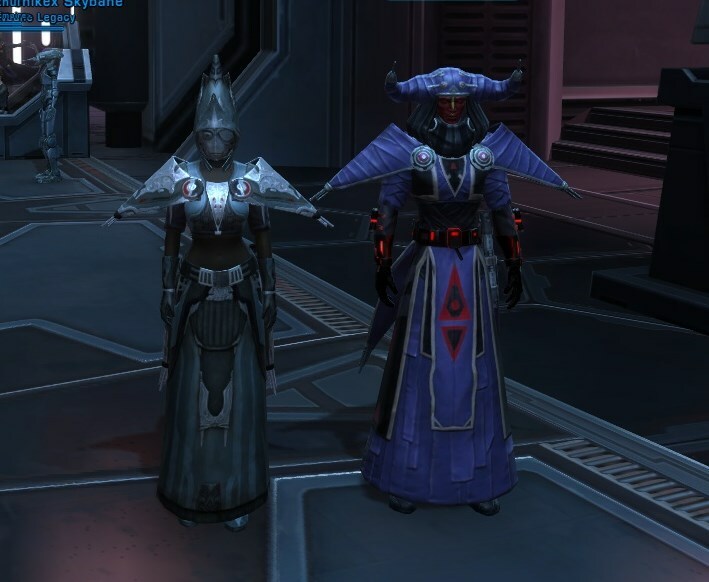 Our barely a month old Sith inquisitor duo hit fifty for one thing. 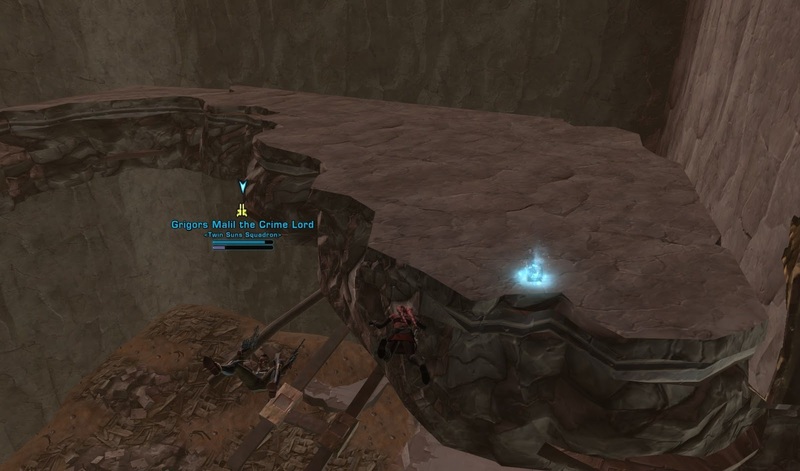 I took my worst ding shot ever, as the bonus boss of Battle of Ilum landed on my head right on cue. "Remember how cool we looked while levelling?" "Don't remind me, those were the days..."
The Sith inquisitor story write-up will have to wait however, as we only just finished Belsavis in terms of quest progression. Speaking of finishing levelling before finishing your class story, I also took the opportunity to finally complete my Scoundrel's class story (she dinged fifty in January if you remember). In her case I hadn't been that fussed about seeing it through to the end quickly, as she was already my second smuggler and I had seen it all before. Still, in the end it was interesting that the very final bit of my class story led to a completely different conversation for a dark side aligned character, compared to what my light side gunslinger had experienced. Also, getting all the datacrons on Corellia (something that I hadn't done before) was pretty hilarious. Fun experiences > fast experience, I say! I've started leveling a Scoundrel (more on that in a post), but my Inquisitor is still at L38. Am I killing you with my silliness or with how fast I keep levelling more alts? If it's the latter, keep in mind that a) I only play the one MMO, 2) I have a lot of free time, and 3) I have help a lot of the time. I'm bad at playing dark side as well. The smuggler in question is only Dark II and suffered from a fair amount of "light side dilution", but it was enough to see the different ending (well, that and having made the "right" dark side choices at important points in the story I'm guessing). Being a completionist and as one who has a good memory for routes and things like that I find I level very fast indeed. I know doing every quest all of the time slows me down but thats the point it slows me down. I just started leveling a operative and I was level 8 before I even got to the end of the second class quest and I'm going to be level 10 before the end of the third. In some regards I view double xp as a problem not a solution as I feel it will get people to the end game before they have really learnt their class. Then again that could just be me, possibly. Wait til your on 50 number 20 like me then tell me this exp is a bad thing >.< if I have to do Hoth/Correlia one more time I will kill everyone I swear! I couldn't agree more... 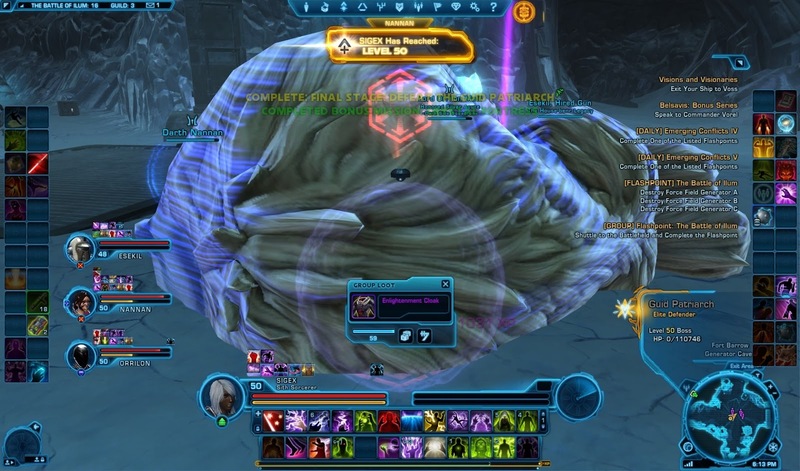 The levelling experience in SWTOR was probably the best I've had in any game ever. It was so incredibly immersive and absorbing, I can't imagine why I'd want to do *less* of it by charging through the levels faster. I used the double xp to push my trooper past planets I have recently done twice (Consular + smuggler). Since my trooper is a healer I mostly did flashpoints and warzones, focusing my questing mostly on my class story. I basically want to hit the end of chapter 2 next weekend so that I can have all four buffs available on my characters. I personally loved the double XP. It allowed me to focus almost completely on my story quests (plus a few extras here and there) and really distill my gameplay experience. Oh sure, I was hitting levels so fast that it made my head spin, but I don't think that's a bad thing. Plus, it's not permanent. And I'm already looking forward to the next weekend when I can charge through Alderaan with the utmost speed! In the past, my position has always been that I either do or do not like the leveling game. If the former, then why would I pay to skip it, and if the latter, then why am I playing at all? The thing that has me in the opposite camp in SWTOR is the shared content. The three alts I'm most interested in playing are an Operative (25), a Sith Warrior (20) and an Inquisitor (12 or so). The more time I spend choosing, the more non-class content I'll need to repeat. Meanwhile, as someone who *gasp* does not always keep up a subscription, I can expect a sharply limited rate of exp that leaves no room for ever skipping anything, even with Legacy and potion boosts to exp. In this context, the fact that I just skipped an alt past the just about the entirety of Tatooine is near priceless - it's not just the progress on that alt but that now if I repeat that planet on a future alt during a non-bonus time, the content will actually be new to me. I'll admit that I can see the appeal for free to play/preferred players since their default experience gains are slower, which makes it harder to pick and choose content while levelling. But as I said, using subscriber status as my baseline, doubling that again strikes me as excessive. 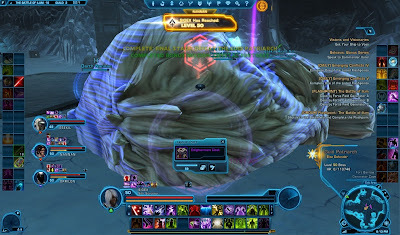 In a story heavy MMO like SWTOR I never enjoyed double XP, though I can understand there are reasons to want it. Why aren't these types of weekends or bonus periods optional? Either give the buff in a time-limited consumable (potion or stim) OR allow players to toggle the buff off or cancel it. Surely it can't be a surprise to any MMO dev that the playerbase will never have just one opinion on anything in game?